Despite two decades of court-ordered busing and more recent, less coercive efforts to foster school integration, Denver Public Schools today is the most segregated school district in the metro area, an analysis of enrollment data conducted by I-News shows. 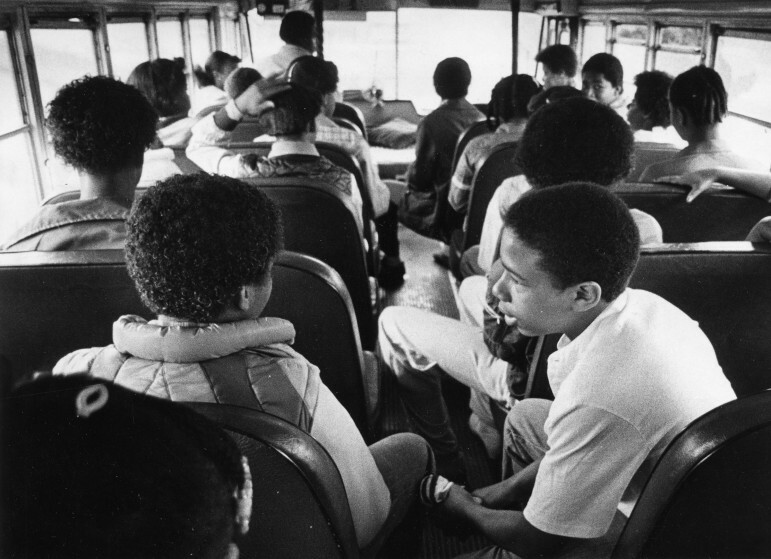 Busing from 1974 through 1995 in some ways accomplished what it set out to do — integrate black students, who had been deliberately isolated in separate schools by DPS for decades before a federal lawsuit put a stop to the practice. But Latinos were largely left out of the equation in the Keyes vs. School District No. 1 desegregation case. And today, Latino students are arguably more segregated in predominantly Latino schools than black students were in the pre-Keyes days. Reasons for today’s patterns of segregation are different from those that caused racial isolations in schools 40 years ago. Back in the late 1960s and early 1970s, the Denver school board deliberately segregated schools through a series of policies that the U.S. Supreme Court ultimately found violated the Equal Protection Clause of the U.S. Constitution. Today, the return to neighborhood schools in a city where many neighborhoods are racially and socioeconomically segregated is the major cause of segregated schools. In some cases, schools that are integrated today are in gentrifying neighborhoods, where the population is becoming more white and affluent. Those schools are likely to become increasingly white over time, as lower-income, predominantly minority families are pushed out by rising housing costs. “It's not that it's a silo that the district has intentionally created these segregated schools, but it is a reflection of the housing demographics and how we have isolated people by income, and race, and ethnicity,” said Theresa Peña, a former Denver school board member who attended DPS during the busing era. The case for integration is about more than the belief that people of various colors and creeds should learn and live together in our increasingly diverse society. There’s also an academic argument to be made. Although the academic results from busing were mixed, numerous studies over the past decade show that socioeconomically and racially mixed schools boost the achievement of low-income students of color. More affluent students do not suffer academically as a result, the studies show. When schools tip to over half low-income, which in most cases also means over half students of color, the benefits of integration begin to diminish. 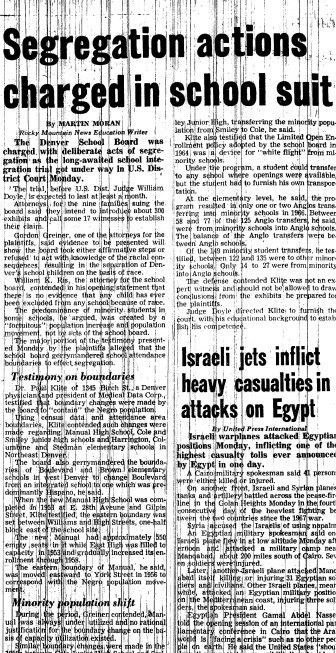 A 1973 Rocky Mountain News story about the Keyes Case start in District Court. Under any measure, Denver has a long way to go to achieve integrated schools. And given the racial composition of students in the school district, an ideal mix of students in all schools would be impossible to achieve. Back in 1970, when the Keyes case was first decided in U.S. District Court, white students made up the majority of DPS students — 62 percent, while Latinos comprised just 23 percent. Today, white students account for 22 percent of DPS students, Latinos 57 percent. Still, few DPS schools reflect the overall racial composition of the district’s student body. One way to look at the magnitude of racial isolation in DPS schools is to calculate how many students of each race would have to move to another school to achieve in every school the same racial composition as the district as a whole. The result: More than 57 percent of white students would have to move, 51 percent of Latinos, and 44 percent of black students. More than 80 percent of the district’s Latino students attend schools where at least half the student are Latino, with most of those student in schools where between 70 and 90 percent of the students are Latino. Fully one-quarter of Latino students attend schools where nine of every 10 students are Latino. By contrast, more than three-quarter of DPS’ black students now attend schools where 30 percent or fewer of the students are black. White students tend to remain clustered disproportionately in predominantly white schools, though the distribution of white students is more proportional than it was in pre-busing days. Today, 40 percent of the district’s white students attend schools where at least 60 percent of the students are white. Given that white students comprise under a quarter of all DPS students, this clustering by race is striking. In 1970, 84 percent of white students attended schools that were at least 60 percent white. However, the proportion of white students in the district back then was nearly three times greater than it is today. By comparison, the black student population as a percentage of the total has remained relatively flat — 15 percent in 1970, 14 percent today. Some of Denver’s most racially isolated schools are charters. More than 96 percent of students are Latino at KIPP Sunshine Peak Academy and three campuses of STRIVE Preparatory schools. These schools, however, pride themselves on working with high-poverty, minority populations and producing significantly higher-achieving schools than their traditional neighborhood school counterparts. STRIVE was founded “under the belief that students from all backgrounds deserve a college preparatory education regardless of race, economic circumstance or previous academic achievement,” the STRIVE website says. DPS-run schools with similar populations typically have lower test scores and frequent leadership changes, leading to a greater sense of instability. In all, six schools in Denver have student bodies that are more than 95 percent Latino. Only one of those has a white population of more than one percent — Sunshine Peak, at 1.1 percent. At the other end of the spectrum, six DPS neighborhood schools have white populations over 80 percent. Five of these schools are located in affluent, predominantly white neighborhood of southeast Denver. The sixth, Polaris, is a gifted and talented magnet school located just northeast of downtown. Only one of those schools has a student body that is more than 10 percent Latino — Cory Elementary, at 11 percent. DPS officials say they are aware of these trends and are working to combat them. In 2010 DPS began rolling out “enrollment zones,” under which families would be assigned to one of several schools within broader boundaries than those surrounding traditional neighborhood schools. Families could list their preferred school but wouldn’t be guaranteed a spot in that school. They would, however, get a seat in one of the schools within their zone. One of the motivating forces behind the zones, at least in the past two years, has been to create more diverse schools. In a 2014 interview with this reporter, Boasberg said enrollment zones help break down neighborhood patterns of segregation by drawing from a larger, and therefore more diverse area. “In Denver, in many neighborhoods if you put a compass point down on the map and draw a very small radius out from it, a half mile, you will often find within that circle you draw not a lot of racial and economic diversity,” he said. The main focus of enrollment zones is on middle and high schools. “Given the importance parents place on the school (for their elementary-aged children) being close to home, and the fact that elementary schools are traditionally much smaller than secondary schools, I think you've seen basically very little change there,” Boasberg said. Bill de la Cruz, director of DPS’ office of equity and inclusion, said in some cases families need to overcome deeply ingrained fears to feel comfortable placing their kids in an integrated school. “The crux of it is a pretty large misunderstanding about the impact of race in a student’s ability to get a good education, with the idea that if my white student is being educated with a group of students of color that they’re going to get less, or if my student is educated with a group of students that are not at grade level then the bar is going to be lower so that we can meet their needs,” de la Cruz said in an interview with Rocky Mountain PBS. Ricardo Martinez, co-director of Padres y Jovenes Unidos, a community organizing group, said it’s easy for families in high-performing, segregated schools to forget that not everyone has it as good. “No one faults parents for looking for the best for the children. The problem is if we don't fight to improve the schools for all our children,” he said. The struggle to integrate schools will be an ongoing one, but it’s a worthy fight, de la Cruz said. “We’re at a place now where racially, ethnically, we need to come together to realize that all students matter, and the success of all students is based on our ability to work together,” he said. This is part of Rocky Mountain PBS’ ongoing coverage of Race in Colorado. Standing in the Gap examines race in public education in the state. To learn more, visit rmpbs.org/thegap and watch the four-part documentary series on Rocky Mountain PBS at 9 p.m. Nov. 12 and 19.